Receiving the same call over and over again from your mom who doesn’t remember is many things. Disruptive. Confusing. Stressful. Tiring. And above all, disheartening. And, if you don’t watch yourself, you can end up saying something to her out of stress that hurts her feelings. Repeat dialing is a common behavior of seniors with memory issues, Alzheimer’s, and other dementias. Watch this UCLA Health Caregiver Training video on one way to deal with these problem calls. Many caregivers struggle to deal with this problem. As a result, caregivers feel the only solution is to remove the loved one’s phone. But, how will you be able to contact them? And are you taking away yet another lifeline, inflicting loneliness and isolation on her? And what about 911? How can she call emergency services without a phone? teleCalm® offers a better solution for compulsive calling. 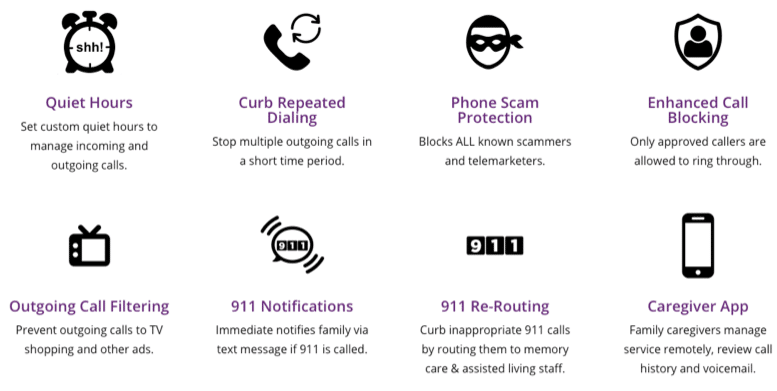 Repeat Dialing℠ is an optional feature that is part of teleCalm’s Caregiver phone service. It is activated in the Caregiver App. The feature triggers when your loved one dials the same person too many times in a defined period. As a result, teleCalm automatically blocks additional calls attempts. As caregiver, you can receive a text notification that the feature has been triggered, if you choose. When trying to make the repeated calls, your loved one will hear a message. The message says the person they’re trying to call is not available, and to try back later. When the repeat dialing behavior stops, the feature turns off and they can dial out normally.